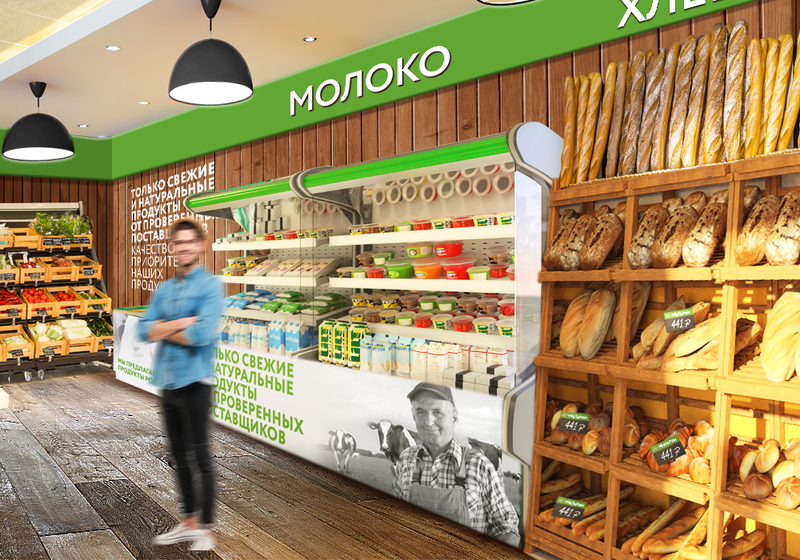 For agricultural holding «Kuban», which opened a network of stores with its own production under the brand «Moya Stanica», we developed a retail space design concept and design for the new brand. The structure of the agricultural holding "Kuban" includes dairy and livestock farms, a sugar factory, grain elevators, seed processing enterprises. All this makes it possible to offer the buyer a large assortment of high-quality products: fresh meat, fresh milk, aromatic and fresh pastries, chilled semi-finished products, and much more. 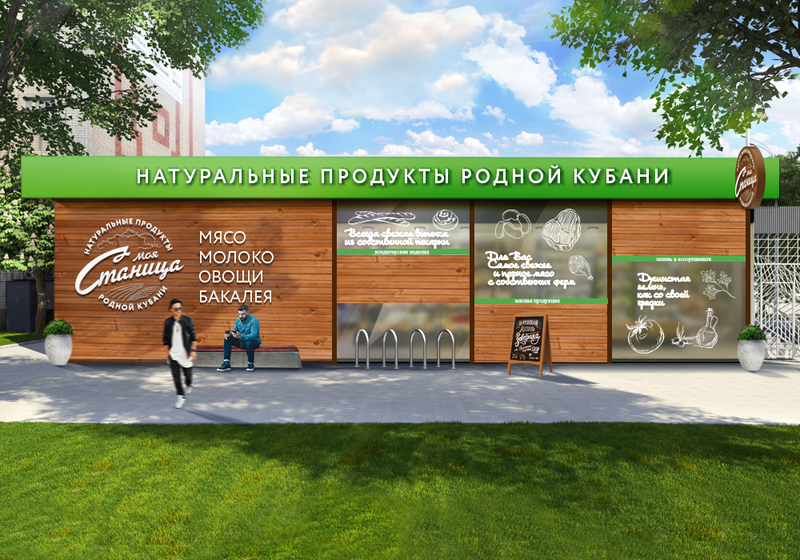 “Moya stanica” is a new network of stores, which unites natural foods from the agricultural holding under its own brand. Opening your own stores gives you the opportunity to offer the buyer a large assortment of high-quality products of our own production and completely eliminate middlemen and logistics costs, keeping the “prices from the manufacturer”. We were faced with a serious task to develop a corporate identity and interior for stores, as well as packaging design for products that go under the same brand. 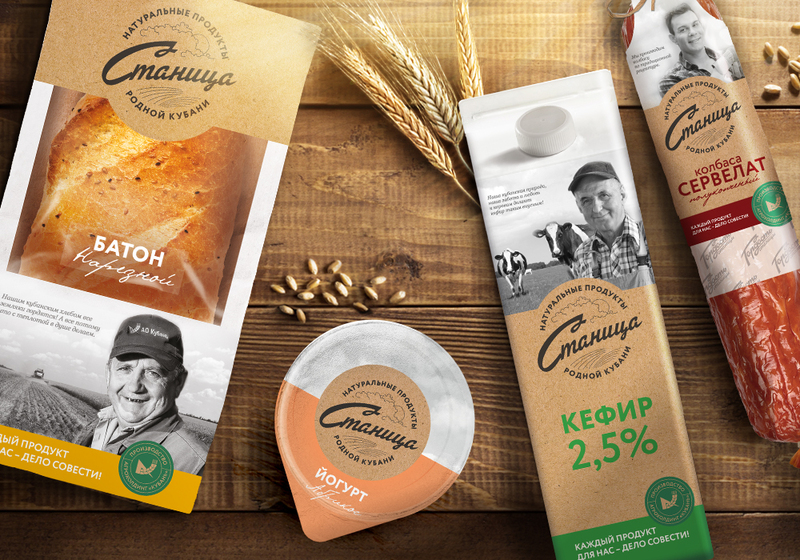 Naturalness, freshness, clear composition, absence of unnecessary additives and cross-category assortment of products grown in the Krasnodar are the distinguishing features of the new brand products. 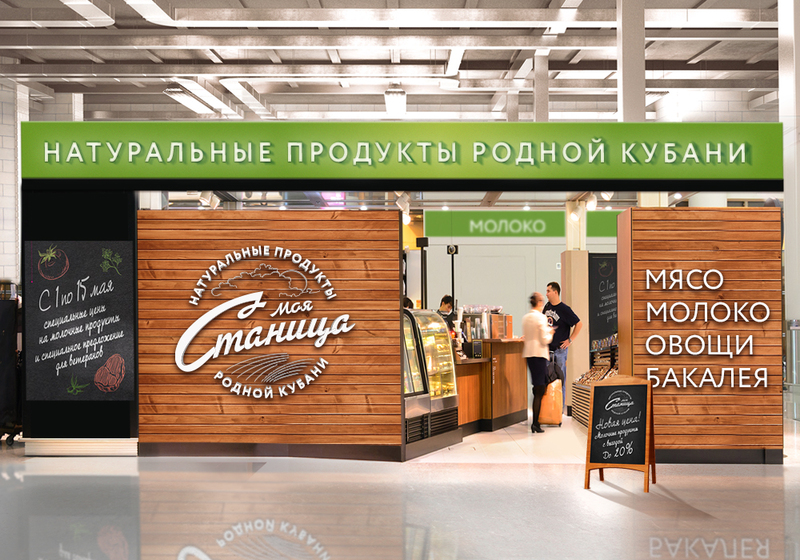 We expressed these key values in the descriptor “natural products of native Kuban”, which allowed us to reflect the essence of the new store and inform the buyer about its main differences from others. Krasnodar region is called the southern wealth of Russia. The fertile and generous lands of the Kuban feed all of Russia. This is reflected in the logo, symbolizing the endless crop field, over which clouds are floating slowly. The desire of manufacturers to create such a brand, which can be proud of, to transfer responsibility for their product, confidence in quality raw materials to each customer and a guarantee - this attitude to their business and customers formed the basis for brand positioning. 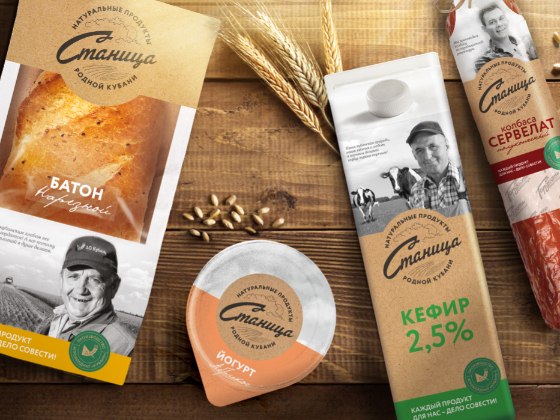 The products from the agroholding Kuban under the brand «Moya Stanica» can be found not only in the same-name retail stores, but also in the large federal chains - Magnit, Lenta, O`key and Metro. The design of the shops is made in a warm and cozy country-style, reminiscent of a peaceful rural life where products are grown and produced. Stylish wood trim makes you pay attention to it, and the naturalness of the materials accurately reflects the essence of the brand. Grocery packaging rhymes with the design concept of the stores and supports the ideas of naturalness through the use of crafting and natural shades. The topic of responsibility and love for their work is revealed in the heroes of the package: ordinary people working in the agricultural holding whose daily work allows us to buy organic products of the Kuban and trust their quality. The claim “every product for us is a matter of conscience” supports the general idea of the brand. 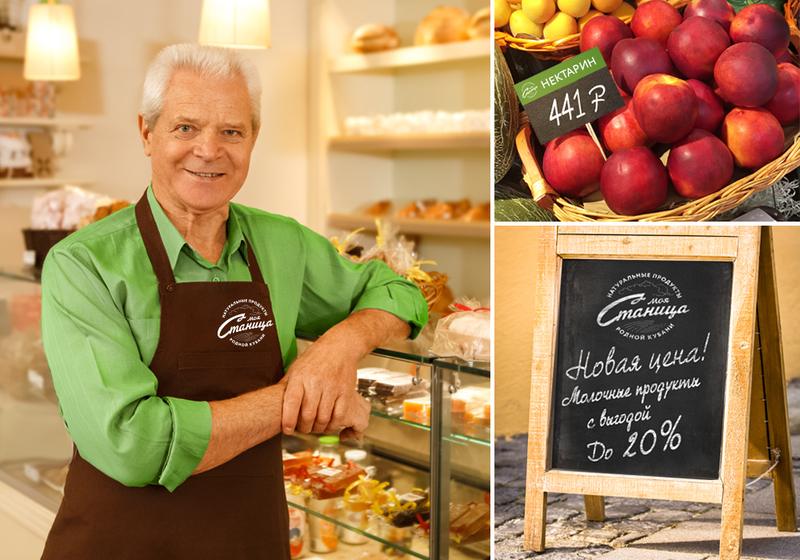 The chain of stores successfully operates in the region, but the created corporate identity allows the new brand to successfully open in any region without losing its identity and the image of the store of natural products.